In the world of fashion there is nothing too expensive. If you are a true follower of the latest fashion and fad then the price of the fashion items should not be much of a concern to you. 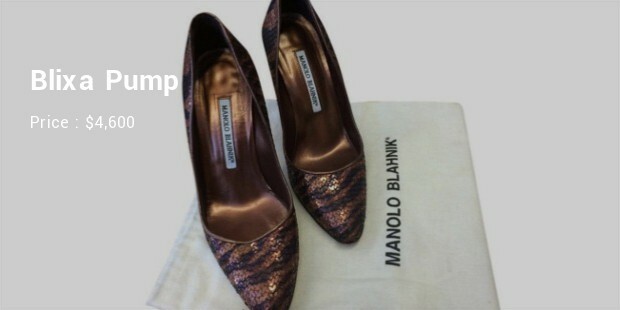 Manolo Blahnik is one of the most exclusive designers of fashion apparels and footwear in the world. The designer in known to create some of the most intriguing and elegant designs focused on women. The Blixa pumps are the most expensive women’s shoes from the design house of Manolo Blahnik and are priced at an astounding $4,600. These are hand-crafted from genuine alligator leather for maximum elegance and style. These feature a pointed toe with an open ‘v’ amp. Made in subtle beige color these pumps feature 3.5 inch heels fixed to a sturdy leather sole from Italy. 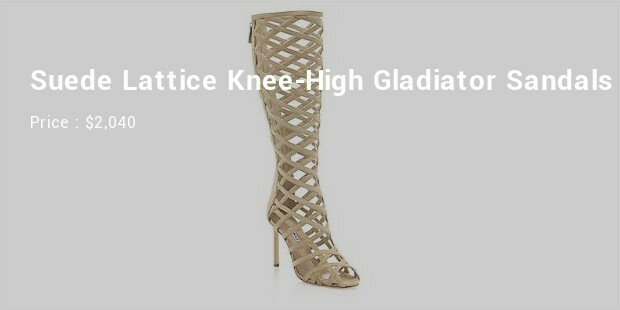 The Suede Lattice Knee-High Gladiator Sandals are rightly priced at around $2,040. These Manolo Blahnik creations are most unique with the intricate lattice work made from genuine soft suede leather which is set on a pair of sleek stiletto heels. These sandals also feature a peep-toe and back zipper for comfortable wearing. The leather sole, inner lining and the padded insole add to the comfort factor immensely. 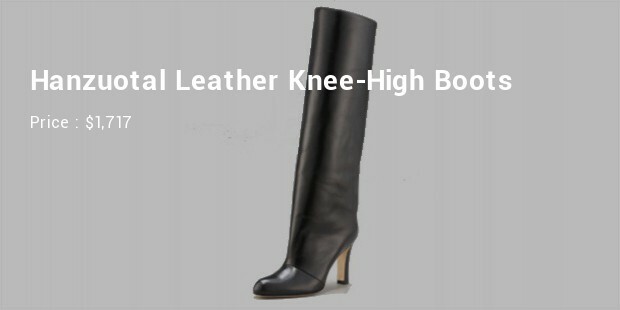 The Hanzoutal Leather Knee-High Boots are priced at an expensive $1,717 from the house of Manolo Blahnik. These are comfortable genuine leather high boots made exclusively in Italy. These feature a sleek pointed toe and a 4-inch heel on a leather upper portion. These are of the pull-on style and have no straps or zippers for the unhindered look. The Suede Stretch-Gore Boots from Manolo Blahnik are price at around $1,610. These are handcrafted in Italy using exclusive soft suede leather. 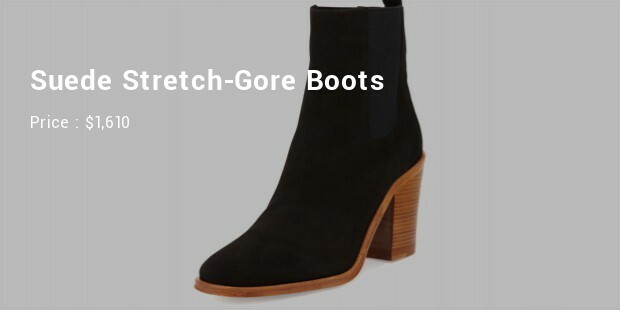 The main features of these boots are the unique stretch side gores for the perfect and most comfortable fit. The leather lining and sole as well as the lightly padded insole provide the required comfort level to these chic high boots. 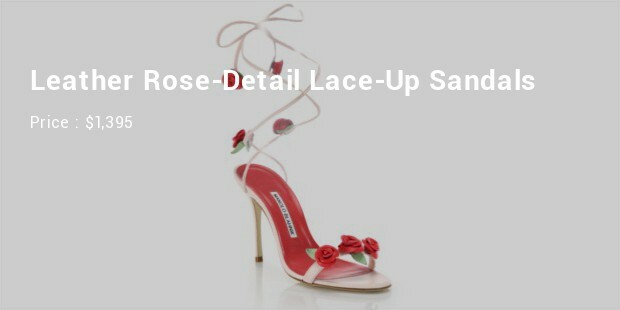 The Leather Rose-Detail Lace-Up Sandals by Manolo Blahnik are priced at around $1,395. These are designer and exclusive sandals featuring an intricate and beautiful design of appliquéd roses in the lace-up design. The heels are 4-inches with the upper part made from genuine leather and fitted to an open-toe and lace-up lower part. 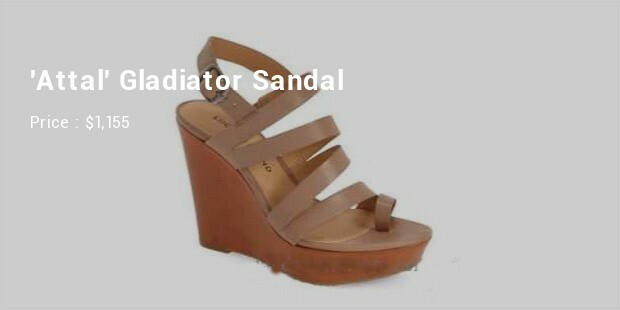 These exclusive designer sandals also feature leather inner lining and sole along with padded insole for added comfort. The Suede Lattice Boots from Manolo Blahnik are priced at a costly $1,340. 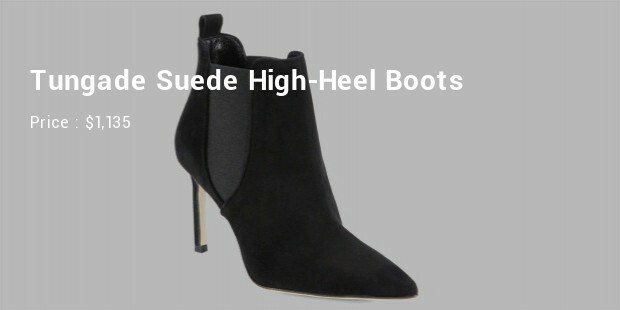 These elegant genuine suede leather booties come with a peep-toe and a 4.3-inch covered heel. The upper portion is made from fine suede leather and goes excellently with the peep-toe design and back zip for easier wearing. These genuine Italian-made booties also have leather lining and sole with padded insole for additional comfort. The BB7 Anaconda Python Point-Toe Pumps are priced at an expensive $1,290. These are handcrafted in Italy using the finest and rarest exotic python leather in pink color. The python-leather upper part compliments the small 2.75-inch heel elegantly. There is leather lining and inner sole for added comfort. The ‘Attal’ Suede Lace-Up Sandals by Manolo Blahnik are priced at around $1,245. These are made in Italy by experienced shoe-makers using high-quality suede leather. These are lace-up styled sandals with a stacked heel of 3.5-inch. The upper portion is made from suede leather and carries nicely with the pee-toe and lace-up design. The Attal Gladiator Sandals are priced at around $1,155 and are one of the best-designed footwear from Manolo Blahnik. These are made from genuine leather in the upper lining and the inner sole for added comfort. The straps are set curving from rich suede leather finish to give these sandals a truly gladiatorial look with an open-toe and slim block-heel design. The Tungade Suede High-Heel Boots are priced at around $1,135. These are elegant suit-all high boots handcrafted in Italy. These boots feature comfortable stretch gore sides for easy wearing. The 4-inch high heels perfectly compliment the pointed-toe. The leather inner lining and sole as well as the padded insole offer the best comfort and style as well. These Manolo Blahnik creations might seem priced extremely high but the highest-quality materials used and the intricate and unique style and design by Manolo Blahnik make these shoes and sandals rightly priced. These are exclusive designer footwear from the renowned designer and have been worn by various A-list celebrities as well as other popular socialites.